HAIFA, Israel, December 3, 2010 (ENS) – Firefighting aircraft have rushed from across Europe to help Israel extinguish the largest wildfire in the country’s history, which broke out Thursday on Mt. Carmel, near the northern port city of Haifa. But the planes are grounded for the night, leaving firefighters on the ground alone to battle the spreading blaze. The fire has claimed 41 lives, and four other people – two police and two firefighters – are missing. Hundreds of houses have been burned to the ground and authorities have evacuated some 15,000 people from areas near the fire. 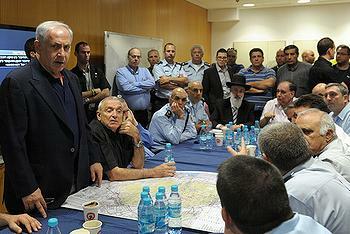 More evacuations may be necessary, said Prime Minister Benjamin Netanyahu, who arrived in Haifa Thursday. Police spokesman Micky Rosenfeld told reporters that most of those who lost their lives were Israeli prison guards traveling by bus in an attempt to rescue Palestinian inmates at a nearby prison. The bus caught fire after a tree fell across the road, blocking its path, police said. Many of the guards died inside the bus, while others died trying to flee. The prisoners survived. Rosenfeld said 16 people remain in hospital, including Haifa Police Chief Ahuva Tomer, who is in critical condition. The wildfire spread on Friday night, burning several houses in the town of Ein Hod and the religious community of Nir Etzion. 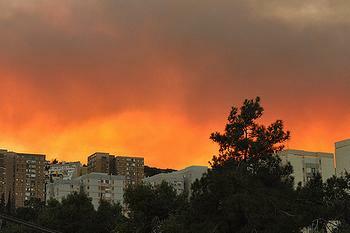 The flames are near Haifa University and the university and dorms have been evacuated. 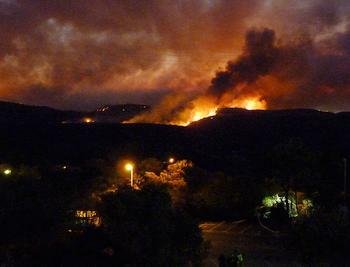 The blaze has reached the Carmel Forest Hotel and engulfed the Hai-Bar nature reserve, from which the wild animals were released, according to a “Haaretz” newspaper report. The fire started in brush left tinder-dry by lack of rain. Fire investigators say their preliminary probe showed no signs of arson. Instead, they believe the fire started at a location west of Ussifiya village where household trash and tires caught fire due to a cause yet to be determined. The European Commission activated the EU Civil Protection Mechanism Thursday night in response to Israel’s request for help. “Alongside my condolences to the victims’ families and friends, I want to express solidarity with the people affected by the fire, and to reiterate to the authorities of Israel that Europe stands ready to work closely with them in combating this catastrophe,” said European Commission President Jose Barroso. Netanyahu said today that four aircraft have arrived from Greece and Cyprus has sent a plane and a helicopter. UK Prime Minister David Cameron sent two British helicopters from Cyprus. Some 100 firefighters have arrived from Bulgaria. 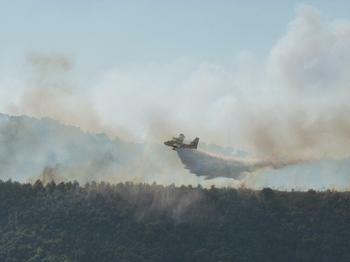 A small Israeli plane drops water on the blaze. Further aid is on the way from Egypt, Jordan, Spain, Azerbaijan, Romania and Turkey, which apparently has dropped its hostility over Israel’s deadly raid on a Turkish Gaza-bound flotilla in May. Prime Minister Netanyahu called Turkish Prime Minister Recep Tayyip Erdogan to thank him, saying, “We very much appreciate this mobilization and I am certain that it will be an opening toward improving relations between our two countries, Turkey and Israel.” The Turkish leader expressed his willingness to help and Turkey’s condolences to the families of the victims. Russian Prime Minister Vladimir Putin has sent a large Russian firefighting plane, the largest of its kind in the world, which arrived this afternoon and will go to work in the morning. Netanyahu said his government has hired an American plane from a private company, a “supertanker” that will arrive Saturday afternoon. President Obama said that USAID and the Department of Defense will deliver large procurements of fire-retardant chemicals this weekend. The President said the first U.S. specialized technical team will arrive Saturday, with other teams to arrive shortly thereafter, and said he is pursuing a “full court press” to help Israel in this emergency. Netanyahu said that at Sunday’s Cabinet meeting, he will submit a national plan to deal with all of the needs of those who were injured and are in distress.